Collecting vintage football programs is a great way to show school/spirit and gather wonderful artwork. Some collectors only want programs from their schools/teams, and others just for the beauty, but nothing is quite so wonderful as when you find both within the same program. Some people collect football programs to make money; they sell from $1,200 to 25 cents. 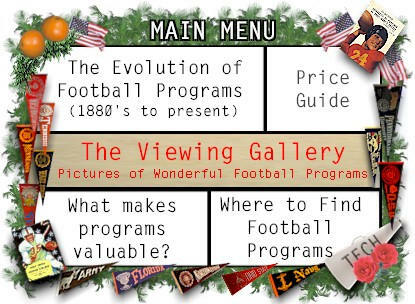 This guide is dedicating to displaying vintage programs & showing the evolution of programs through the years. Like everything else that changes, football programs have evolved, and can be classified into different eras. I mainly collect college football programs, so most of the examples will be college programs. This site also discusses pro programs, football guides and other collectible vintage football publications. This site may be navigated by clicking on the words below in the main menu. My personal collection of football pograms is quite small. Most of the scans you see are taken from online auctions at ebay.com - so please do not write to me offering me money for these items - I probably do not even own it! Please email me with your thoughts on this site, and any corrections or additions- I'd love to hear from you.